I am an Associate Professor of Geosciences in the Department of Geosciences at Murray State University. I teach several geoscience courses including Earth Science, Geographic Information Systems, Advanced Remote Sensing and Digital Image Processing. I have developed "hands-on" teaching using real world applications in my classes. I have been involved in several grants for research and establishment of a student laboratory and a research laboratory. My interest in the FIRST project is that I am interested in learning what other faculty are doing to improve their courses and how I can improve my own teaching. I am an assistant professor in the Department of Biological Sciences, Center of Excellence in Reservoir Research, and Hancock Biological Station at Murray State University, Murray, KY. I earned a B.S. degree in Botany from the University of Michigan, an M.A. in Biology (Botany) from Western Michigan University, and a Ph.D. in Aquatic Ecology from the University of Michigan. My primary course load includes general biology for non-majors, general botany, systematic botany, and phycology. I also teach limnology or stream ecology during the summer session at Hancock Biological Station. 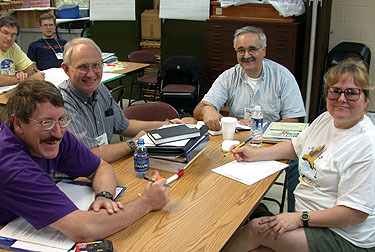 I am very interested in the application of inquiry-based learning techniques and tools to the general botany course. I am involved in the outreach program at HBS for elementary and middle school children. I have served on the Science Advisory Board of the 4-Rivers Watershed Watch program and I will be serving as President of the MSU chapter of Sigma Xi during the 2002-2003 academic year. My research funding includes an array of water quality grants from U.S. EPA, NSF and Kentucky Division of Water. I have mentored and advised several undergraduate and graduate students in accomplishing the research goals of these grants and all have presented their project results at regional, state, and national meetings. I earned a B.S. in Civil Engineering at Tennessee Technological University in 1976. Since I couldn't find a job in doing what I wanted to do, I went on to graduate school at Utah State University, obtaining my M.S. in Civil and Environmental Engineering in 1978. This time, I was able to get a job, and I worked in for a large environmental engineering firm for about 12 years in Washington, California, Arizona, and Florida, primarily in the areas of industrial wastewater treatment and clean up of contaminated soils and groundwater. Then, thinking that I'd like to be a teacher, I returned to Tennessee Technological University, earning my Ph.D. in Engineering in 1995. I've been at Murray State University since then. I have joint appointments with the University of Kentucky and the Korea Advanced Institute for Science and Technology, teaching classes on soil and groundwater remediation. Most of my research has concentrated on the use of natural systems such as constructed wetlands for wastewater treatment and I'm involved in several watershed protection efforts. I am a Professor of Biological Sciences and Geosciences at Murray State University. I received my B.S. in Chemistry from Providence College and my Ph.D. in Geological Sciences from Columbia University. In graduate school my main interests were oceanography and limnology, and I spent the first part of my career primarily doing teaching and research in oceanography. Over the years my research interests slowly shifted to freshwater environments. Prior to coming to Murray State in 1991, I had positions at the University of North Carolina, the University of Alaska-Fairbanks, and the University of Wisconsin-Milwaukee. I was attracted to Murray State by the opportunity to work with other faculty at MSU's Center for Reservoir Research. I teach majors and non-majors courses in the department of Geosciences, and upper division ecology courses in the department of Biological Sciences. The courses that I enjoy teaching most are interdisciplinary in nature and content. I have been a research advisor for both undergraduate and graduate students and I try to incorporate current research developments into my course curricula whenever appropriate. Through involvement with FIRST, I hope to learn new methods and approaches for better engaging students at all levels in both classroom and laboratory settings.